3. Select Administrator, type password admin. 7. Select Internet option ON> Select Ethernet option from drop down menu > Press OK as shown in figure. 8. Router will reboot to apply the Ethernet option. Again repeat Step 1 to 5. 9. 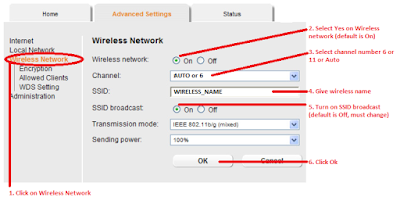 In the screen like below Select PPPoE in Protocol Field > Give username and password in User name and Password field > Give MTU value 1492 in MTU field > Select Always On in Connection mode field > Press OK button. 10. After that router will restart to apply your settings. 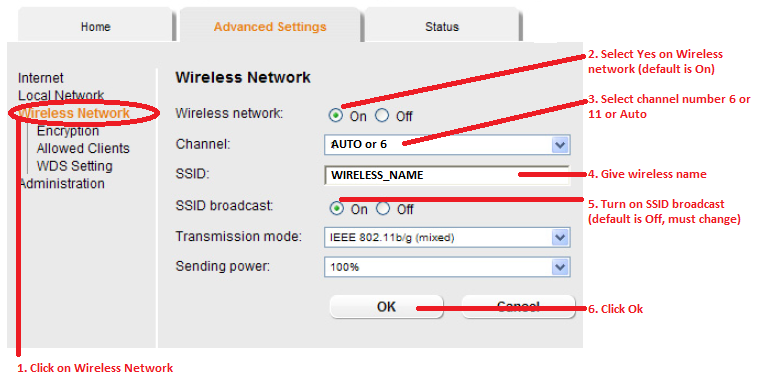 c) Set channel number to 6 or Auto, give Wifi name, select On for SSID broadcast option and click Ok to save the settings. - Check the Internet LED in the router, it should be green i.e. you can access to internet.